The Board Of Control For Cricket In India has finally announced the much awaited IPL 2019 schedule. The 56 matches, contested over a period of one and a half months, will see matches being played daily with weekdays seeing the traditional one match at 8:00 pm while weekends will see double fixtures which will bring the afternoon match into play at 4:00 pm. Having earlier announced the schedule for the first two weeks, proceeding the announcement of the schedule of the general elections to be contested in the country starting April 7, the cricketing governing council has come out with its entire fixture list for the league. The first match will be played on March 23 between CSK and RCB in what promises to be a thrilling encounter, one befitting to begin the extravaganza that attracts to it lakhs of die-hard supporters every season. Factoring in the Lok Sabha elections, the BCCI and IPL management have scheduled the matches keeping in mind the different cities and phases that the elections will be held. To avoid a clash with the elections, matches have been kept clear of cities at a time when the citizens of that area will be stepping out in large numbers to cast their vote. The schedule for the knock-out matches is yet to be announced. As opposed to earlier speculation that matches could be shifted to venues that host lesser matches in the Indian cricketing circuit, the traditional eight stadiums will hold all the group stage matches. The schedule of the marquee tournament stays true to its identity, giving each franchisee 7 home fixtures while the rest of their 7 clashes will be away matches as per the usual format. The eight stadiums that will be hosting the group stage matches are the MA Chidambaram Stadium – Chennai, Eden Gardens – Kolkata, Wankhede Stadium – Mumbai, Sawai Mansingh Stadium – Jaipur, Feroz Shah Kotla – Delhi, M Chinnaswamy Stadium – Bengaluru, Rajiv Gandhi International Stadium – Hyderabad and Punjab Cricket Association IS Bindra Stadium – Mohali. Chennai’s MA Chidambaram Stadium would hold the final match. 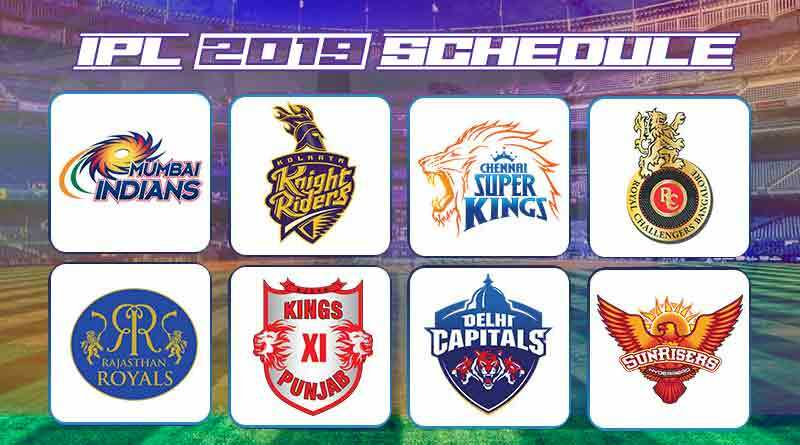 Here’s the complete IPL 2019 schedule – IPL Match dates, venue, time and the teams. For more stories, IPL 2019 Schedule, do follow us on Facebook, Twitter, and Instagram.